I'm a big fan of versatillity so I LOVE these new limited-time products: Blended Seasons stamp set and coordinating Stitched Seasons framelit dies. They cover a myriad of occasions from thank you cards, birthdays and anniversaries to get well and sympathy cards and Christmas! Colour the images with any medium that takes your fancy. I've watercoloured, used Stampin' Blends alcohol markers and for this card I used the Stampin' Write Markers. The limited-time Blended Seasons stamp set and Stitched Seasons dies are perfect for making Christmas cards! The base card is Granny Apple Green. I cut into the Whisper White layer with two of the framelits from the Stitched Seasons set and removed the resulting frame shape (which I kept to one side and used in my next Christmas card). I used the same larger framelit to cut a piece of Poppy Parade which I adhered to the card front, nestled nicely into the empty space to produce one flat layer with two colours. 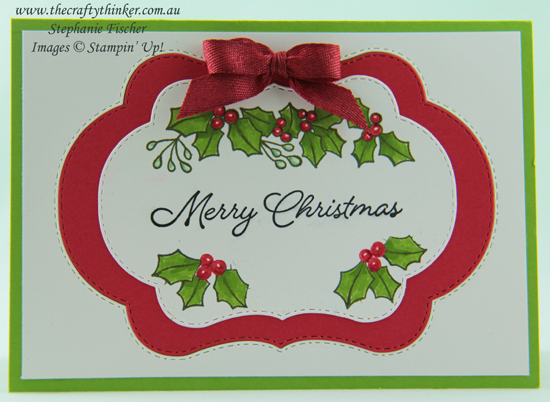 I stamped the holly image at the top of the smaller white label using Mossy Meadow ink. I then thoroughly cleaned and dried my stamp and used Mossy Meadow and Poppy Parade Stampin' Write Markers to ink up just one holly cluster which I stamped into one lower corner and then repeated on the other side. 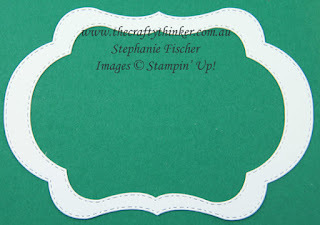 I used Stampin' Write Markers to colour the images in Granny Apple Green, Poppy Parade and Mint Macaron and I added a touch of Cherry Cobbler to the berries by squiggling the marker onto an acrylic block and picking up a little on the end of a Blender Pen. The greeting was stamped with Mossy Meadow ink and then I adhered the decorated label to the card front and added the little red bow. Since I lacked Poppy Parade ribbon, I coloured a length of Whisper White Classic Weave ribbon with Poppy Parade ink and let it dry. These limited-time products will only be available from 1 to 31 August or while stocks last. If you'd like to start using them right away - join now and include them in your starter kit!